If you know me personally, then you know I love to chew gum. I’ve been chewing gum ever since I got my braces off (even occasionally when I had them on…sorry, Mom). Unfortunately, while there were many varieties of gum I chewed and enjoyed, all of them had one thing in common. If they did not have sugar, they had aspartame. Every single mainstream brand and variety contained the controversial chemical which I have eliminated from my diet a few months ago completely. I stopped using equal or drinking diet soda about a year ago now, but with gum, I had a tough time finding a suitable replacement that did not lose its flavor after 10 minutes. I have found the solution, only because I am surrounded by a good amount of organic markets in the Washington, DC area. The brand is called Spry . It is sweetened with 100% xylitol. It can help prevent cavities and tooth decay. It is also low in calories. Most importantly, there are no artificial chemicals put into Spry gum. The soy lecithin in the gum is also GMO-free, which lets you know there are no genetically modified soybeans getting pumped into it. Spry. Kick some aspartame out of your life! My favorite flavor is spearmint, which was always my favorite flavor in mainstream gum. The peppermint and cinnamon flavors are great too. I have not tried the green tea flavor yet. 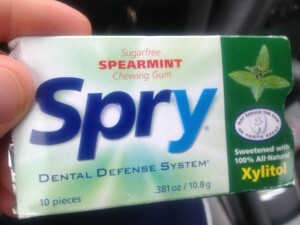 Spry also has a great line of naturally sweetened mints as well. Sure, the cost is a little bit higher than your conventional gum, but the cost to your health is far greater if you don’t take the step to only put natural ingredients in your body. I have not had one headache since I quit aspartame. You may ask, “Where can I get this gum since I do not live by any organic markets?” You can buy Spry gum right here on AMAZON .